We have been learning about UV. 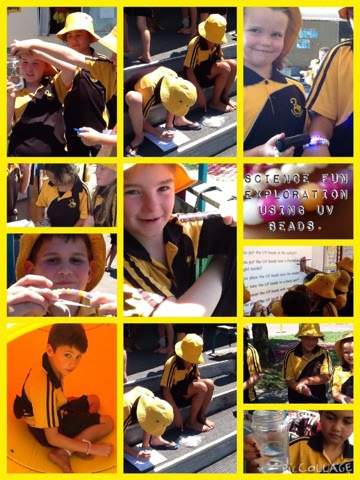 We had a fun afternoon exploring using UV beads. and that the UV beads even changed colour inside the classroom through the window. We are learning the importance of protecting ourselves from the harmful rays but also the importance these some of the UV rays play in our environment. Do you know any facts about UV? Check out the fun we are having being back at school. Welcome to a fun filled new learning year in Room 6. I hope you all had an enjoyable summer break. My name is Janine Bava and I am your child's teacher for 2015. I am proud and excited to be part of the new Team Pango. To kick start the term we have begun with a focus on cooperative learning, relationship building and our class treaty. Together we are co-constructing our expectations of each other in Room 6 and getting to know each other along the way. Pat starts swimming lessons in week 2. We are swimming every day (weather permitting) so please ask your child if they have packed their togs and towel. If your child is unable to swim a note from parents/whanau is required please. Yellows hats are to worn during Terms 1 and 4. No hat no play is the rule. Hats are for purchase from Penny in the office. Meet the teachers evening at the town library - Tuesday 10th February starting at 6pm. Team Pango Powhiri - Thursday 12th February starting at 1.30 in the school hall. I look forward to meeting you all over the next few weeks.